Welcome to the San Marcos High School Library! 2nd Annual Summertime Book Giveaway!! Our 2nd Annual Summertime Book Giveaway was a huge success! We gave away more than 150 books for students to read and enjoy over the summer. Attention students! Please come out to the library patio at lunchtime on Wednesday, 6/1/16, for our 2nd annual summertime book giveaway and the "soft opening" of our new library patio space. We will have treats to share and a free book for everyone. Many of the titles in our book giveaway are advanced readers copies that are either recently published or not even out yet. Don't miss it! 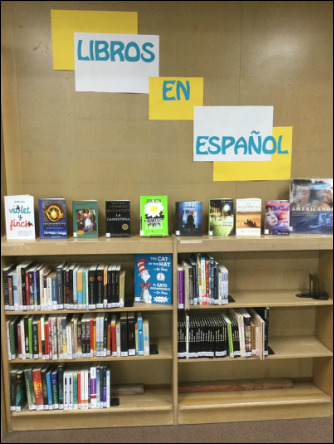 We have recently added nearly 150 books in Spanish to our library collection. Many titles are translations of our most popular YA fiction and nonfiction books. We also have graphic novels, favorite kids books, literary classics, and original works in Spanish. Come by and take a look at these new offerings! Looking for some good summer reading? The 2016 Teens Top Ten list is out! It includes 26 fantastic YA books nominated by your teen peers across the country. In October, during Teen Read Week, teens will vote for the top 10 books of the year from these titles. Click herefor more summer reading ideas. 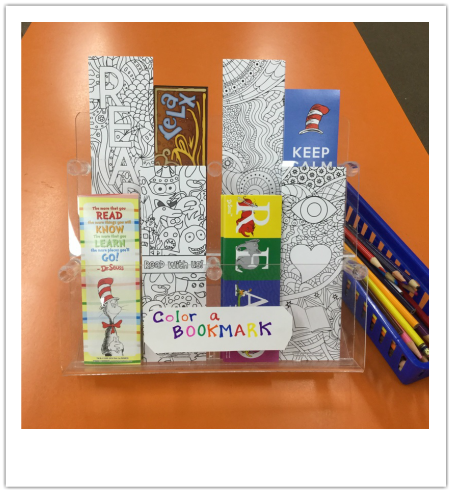 Come by the library and color a bookmark with us! Join the library in celebrating Poem in Your Pocket Day this Thursday, April 21st. Every April, on Poem in Your Pocket Day, people celebrate by selecting a poem, carrying it with them, and sharing it with others throughout the day at schools, bookstores, libraries, parks, workplaces, and on social media using the hashtag #pocketpoem. 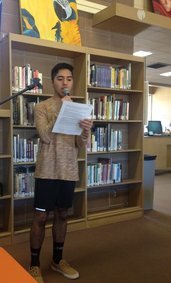 Stop by the library on Thursday to get a poem for your pocket or to share your pocket poem with us! 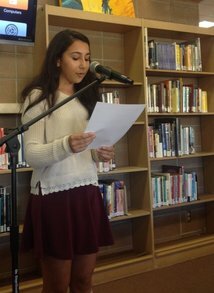 Poetry Slam 2015 poems can be viewed by clicking on the links below. New Seating in the Library! Our new red and blue stools have arrived! Come by and try them out!